The following is a guest post written by Real Estate Tech News Advisory Board Member Chris Clark. You may recognize Chris from her well-known blog, CREOutsider. True enough. But if you want to slay a beast, it helps to know something about it. Too many CRE developers I speak with make all sorts of incorrect assumptions about brokerages and agents. And you know what they say happens when you assume… So here are some real world observations about CRE that may help your battle with the beast. Too many innovators want to revolutionize the industry. Anything is possible, I guess, but if you’re intention is to become the Mark Zuckerberg of CRE, it’s more about ego than what the market wants. Do some REAL market research. And no, talking to your tech inclined friends doesn’t count. You can’t be married to your idea either. Too many developers dig their heels in rather than pivot when the market doesn’t respond. Don’t think you can easily convince them that they’re the stupid ones. 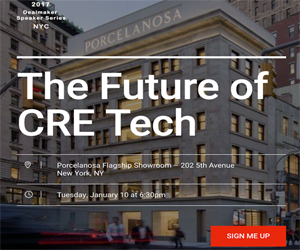 CRE Is a Tech Laggard! It’s so easy to deride CRE as technologically inept and, apparently, convince many investors that it’s true. Show me one brokerage or agent who doesn’t use some kind of technology to do business. And yes - cell phones, email, office networks, accounting software – that’s all technology. It’s just not the tech you think they should use. Before you write everyone off as techno-idiots, talk to brokerages and agents. You’ll find they use more than you think and that many of them would like to use more if they could find good, integrative and reasonably priced solutions to what they need. In case you haven’t noticed, the average age of a real estate agent is around 56. Most of them have been - and are doing - just fine without your app. For most of them, the end game is to continue doing what they’re doing the way they’ve been doing it for another 5, 10, or more, years. And brokerages will let them as long as they make money. They’ll only get out or scale back when all that new tech they’re not interested in takes over. So if you’re trying to convince the majority Baby Boomer agent, for the most part, you’re wasting your time. It’s brokerages you have to convince, so think like broker management instead of like an agent. Brokerages don’t have big profit margins. So you’re dealing with companies that don’t have a lot of money to spend - especially after paying for CoStar/LoopNet. Plus, their agents are likely independent contractors. That means they can’t make their agents do their work in a specific way. Your price per agent plan means they have to pay for all their agents when, if they’re lucky, 20% of them will actually use it. Come up with another way to price your product because pricing per agent is a non-starter. Even LoopNet is offering “company” pricing for some of its products. You can’t rely on someone using their imagination to “see” how beneficial your app will be to them. And saving time isn’t what counts. You can’t promise that anyway thanks to the learning curve that’s almost always involved. Sales people are performance based. Look at what an agent or brokerage does and tell them how they’ll save money ditching what they’re using now. Show some real, hard numbers and get them in touch with users that can help you convince them that the learning curve or extra cost is worth it. Too many apps involve a single business process. That may be fine for agents who are trying to organize themselves and the way they do work. But too many developers try to sell to brokerages who want more integration rather than a sea of data islands. And in both cases, the motivation for getting new apps is often client demand. I have yet to see a brokerage refuse to implement new tech that clients are clamoring for. So don’t restrict yourself to the CRE community. You have to find out what users want. Few people are intentionally dishonest. But how many times has a client insisted they wanted space “here” but ended up “there”? And it wasn’t because you were trying to push a property. It was because you asked a lot of questions, just knew from experience that what people say they want isn’t always what they really want. Keep that in mind when you’re doing market research or selling what you’ve got. You need to dig to discover what people really need or want vs what they say they need or want. It will make your app better. Plus, it will provide ideas for how to present your app in a way that offers solutions to their real problems.